This is part four of my ClexaCon 2018 adventure. April 4-10, I went on a trip to Las Vegas for ClexaCon, all the way from The Netherlands. You can find part one, part two, and part three here. In this ClexaCon 2018 Day 2 blog, I will tell you all about the following panels: Anyone But Me, Bisexual Representation, WayHaught, and Swerve. Next week, you can read all about the rest of this day: the Shoot and Hollstein reunions, the red carpet event before the Cocktails for Change party, and the Ascension Party. It has been ten years since Anyone But Me first aired. Rachael Hip-Flores and Nicole Pacent reunited in this panel and yes, there was as much laughter as you can imagine. They talked about the growth of the show – from a guerilla-style type of shooting (they had no permits when they started filming, Tina Cesa Ward confessed) to shooting with an entire crew – and playing LGBTQ characters after The L Word had just ended. On a final note, Nicole and Rachael, when can we expect that video about the letter? Did you know you can own the three seasons on DVD? Try Amazon or eBay! I was only present at this panel for a little while. That little while made me learn a thing or two, though! The first thing that was amazing to see was how the room was too small for the audience. The place was packed so clearly, we want more bisexual representation. Another thing I learned was when Nicole Pacent said something about The L Word that I had not realized when it happened. You see, when The L Word first aired, I had only recently come out and I was still figuring out my own identity as a lesbian woman; at the time, I apparently had no brain cells available for all the other letters in our beautiful community. They talked about the relationship surviving (Dana: “You have always found your way back to each other. Why do you think that? Dominique: “Have you seen her?”), about what their WayHaught relationship means to the community (Dana: “You have been vocal fans of your fans.”), about the Rosita kiss, and about the whole oh-yeah-I-have-a-wife situation. 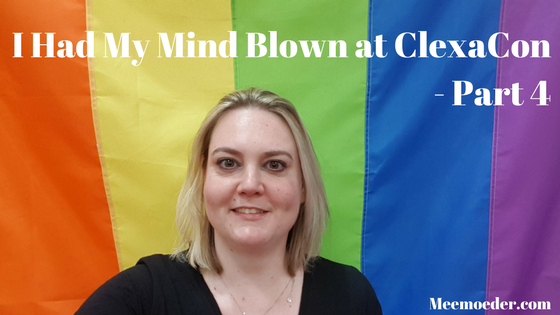 For me, a big moment was this: as you can read in my previous blog and see at the end of my vlog, I was somewhat emotional realizing after the first day of ClexaCon how easily available LGBTQ content is nowadays as opposed to when I was growing up. After about 19 minutes, Kat starts talking about LGBTQ people who are older now but did not have that representation growing up, and she starts tearing up. I think my mouth dropped open. It truly did something to me to hear that acknowledgment from someone like her and to see her get emotional about it. Another panel that I was really excited about was Swerve the web series. You may wonder why I love this show so much. Indeed, after every episode, I have to go to the comment section to figure out what I have just seen. That is precisely the beauty of it. The show does not spell everything out; you are left with questions that make you want to watch the next episode and season. It was not all sad though. At one moment, it was revealed that nobody knew what was going to happen in the next season because Jason Armstrong never lets anyone know beforehand. Winny asked the room to tweet him all at the same time. I bet he had a buzzing phone for a while. Then, they dropped the teaser for season three. At first, they could not get the laptop to work on the big screen. So the entire room got up and stood around the laptop, and the panel watched us watch the teaser. That was another fun moment to be a part of. After the panel, Sharon asked to see the teaser because she had not seen it yet. It was cool to watch Sharon watch her work and see how proud she was. Next week, I will talk about the rest of ClexaCon 2018 Day 2. That means you can read about the Shoot and Hollstein reunions, the red carpet event, and the Ascension Party! Yes, that includes a lot of backstage footage. If you sign up for my newsletter, you can be sure you will be the first one to read it. You can find the sign-up form on the top right of this page or in the footer. Also, do not forget to subscribe to my YouTube channel!